Philip Hansen of San Diego has put a fresh spin on the all-essential reading light. He explains that when he was a little kid, few things were more fun than taking his dad's stuff apart in order to turn it into something else. Old habits die hard apparently, as you'll be able to tell by visiting Philip's Etsy shop, Typewriter Boneyard. He creates all sorts of unique things from vintage electronics. 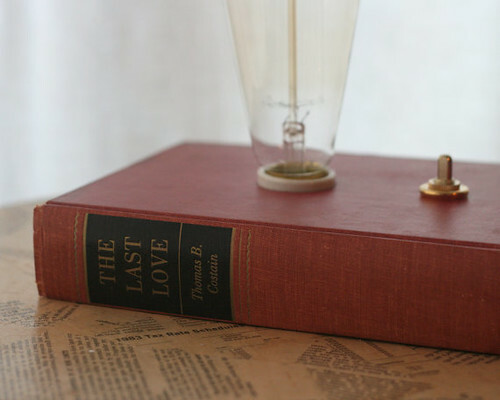 Book art is wildly popular nowadays, but this is the first time I've seen an old tome wired as a light... what a great - and practical - conversation piece. I admire Philip's use of this vintage stuff. Some cool finds at his shop. I love it when something is used for other than what it was intended. I take old windows and put picture collages in them and hang them on the wall. I agree...really cool stuff in his etsy shop. Love the little switch on the book too. He has some interesting things in his shop but I must say that the book lamps are my favorite. What a clever idea.